Which state in Australia has the best craft brewers? It’s a tough question to answer. But that’s just the kind that I like to debate – preferably with a good beer in hand. So I began my quest to answer this question during Good Beer Week at some of the beer venues taking part in the Pint of Origin. Pint of Origin, for the uninitiated, is the simplest of Good Beer Week events that involves great beer bars across Melbourne turning their taps over to beers from a particular state for the week. It’s a great chance to try beers that don’t often make it across borders and to get a feel for how craft beer is developing across Australia. So here is my breakdown of the states form which I sampled to try to answer which one brews the best beer in Australia. There seems to be breweries opening left, right and centre in Tasmania at the moment. While Tasmanian brewers face a challenge to be recognised on the mainland but are really trying to make the state a destination spot for craft beer with the recent launch of the Tasmanian Beer Trail. Tasmanian beers were available at the Gertrude Hotel for Good Beer Week and I sampled a few of the ones that caught my interest. The beers I tried came from the likes of Hobart Brewing, Seven Sheds and Two Metres Tall and each featured unusual ingredients such as rye, spelt, and even quinoa! I can see why Two Metres Tall are already carving out a niche with beers that are truly unique and are closely aligned with their local environment. This approach is really working for them and I think other Tasmanian brewers can also succeed by daring to experiment and be different. There’s some good signs that something good is, er, brewing in Tasmania but I just don’t think the state has gotten there yet. South Australia beers are going off right now and they can already count themselves as a genuine contender to having the best craft breweries in Australia. Adelaide’s Pirate Life can do no wrong, as they quickly become the industry’s favourite craft brewer, adding the Champion Small Australia Brewery award at AIBA to their awards cabinet and blowing GABS punters away with a huge Triple IPA that’s one of the best rated on Untapped from the event. Big Shed are equally delighting punters and nailing every beer they release. Their Nuts and Malts (Nutella Palooza) on handpump at the The Palace Hotel in South Melbourne had lovely chocolate and nut flavours with a light brown body and went down very easily. Their Cherry Ripe Porter seems to have rated best in the battle of the Cherry Ripe style beers at GABS and follows the success of last year’s GABS dessert beer smash-hit the choc-honeycomb Golden Stout Time. Wheaty Brewing Corps haven’t sent a lot of their beer interstate yet but I hope that changes. Their delightful sounding Wheaty Bix breakfast stout ran out just before I had a chance to try it but I did get to the Blueberry Saison was a funky berry delight. In the meantime, you can’t sleep on brewers like Mismatch, Little Bang Brewing and Prancing Pony – who’s 9% Magic Carpet Midnight Ride was the best I’ve tasted from them yet – a big, flavoursome and smooth imperial stout. I’m not quite ready to declare South Australia the best yet but their case is getting stronger all the time and they are rising the fastest right now. I’ve been talking up the rise of NSW as a craft beer state for a while and the beers I had at The Rainbow Hotel for Good Beer Week didn’t hurt the cause. My beer choices included Wayward Brewing’s Fat Charmer, a brilliantly hoppy and malty ale, dangerously drinkable for a beer with 7.5%abv, and Grifter’s The Omen, a chocolatey creamy oatmeal stout. 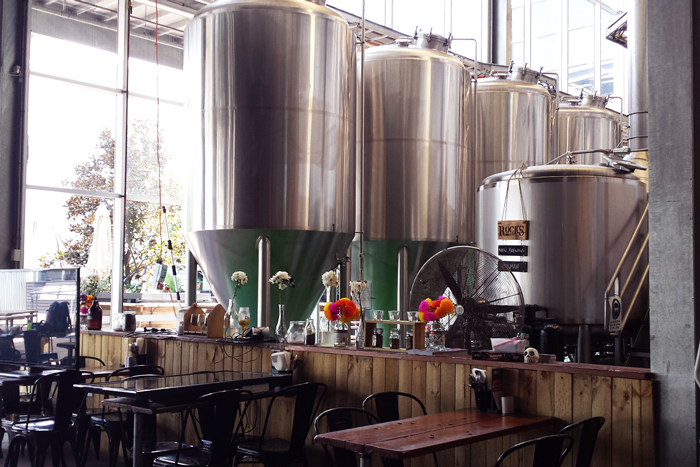 They reaffirmed why Sydney’s inner west is the hottest place for craft beer right now. In regional NSW, Foghorn Brewpub in Newcastle is impressing with one of Australia’s best brewers at the helm, Wagga Wagga’s Thirsty Crow are expanding, and new breweries are opening all the time. Top to bottom, east to west, craft beer is going off across New South Wales. And what I really like about the scene in NSW is that it seems very much focused on servicing the local communities through brewery tasting rooms/bars. I think this bodes well for their longevity and for growing the love of craft beer in the community. I really wanted to give NSW the award as there’s definitely been a lot of excitement in the state but the stalwarts of craft beer in Victoria are still just slightly ahead for me. With a bit of further development, soon I think NSW could rightfully claim to be craft beer’s new leaders. Accuse me of hometown bias if you like but Victoria has been a craft beer leader for a long time and its continued to grow and keep that spot even as other states are closing the gap. The next generation of Victorian craft breweries like Kaiju, Exit and Dainton’s are settling into new breweries and pumping out excellent beers. While the more established breweries like Bridge Road, Holgate and Mountain Goat continue to do good things. When I ranked the top brewers in Australia recently, there were 7 Victorian breweries and I guess it’s no surprise considering that the scene is more established. But to maintain the status of the best beer state they’ll need to continue to grow and innovate. Thankfully the likes of Boatrocker and La Sirene are doing just that with each producing some of the more exciting beers around the country at the moment. Of course, there is no right answer to the question of which state brews the best craft beer but that doesn’t mean it isn’t worth pontificating over. Is Western Australia being unfairly overlooked after being a leader for many years in its own right? Is Queensland getting closer to becoming a contender? Am I just displaying a Victorian bias and have NSW or SA or TAS passed VIC already? You can also answer this question and others in the following survey from our friends Beer Cartel and have a chance to win $500 of craft beer too.